Flat, packed limestone trail. Wheelchair and stroller accessible. 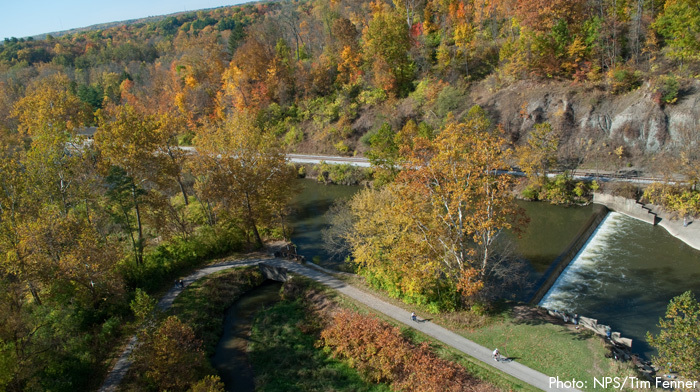 This 4.4-mile stretch is a short hop from CVNP Headquarters and begins with a “spillway,” a channel that whisks away excess water from around the locks. This links to the old road to the Jaite Paper Mill site, one of the earliest businesses to thrive in the Cuyahoga Valley. Wetlands and farm pastures abound along this straight, green stretch, with moderate hiking on the Stanford Trail offshoot, for those looking for a longer trek. Overnight lodging is available at Stanford House. Take I-77 to SR-21 (Brecksville Rd.) Proceed north to Snowville Rd., then proceed east on Snowville Rd. to Riverview Rd. Take Riverview north to Vaughn Rd. then travel east on Vaughn Rd., across the Cuyahoga River. Red Lock Trailhead and parking will be at left. Station Road Bridge, Red Lock, Boston Store, and Lock 29 all offer 24-hour parking. Entrance to the park is free. Tickets are required for the Cuyahoga Valley Scenic Railroad. This section of trail is one of the more picturesque in the entire Cuyahoga Valley. Hikers who are looking to ramp up the exertion level a bit can find rolling knolls here to get in some extra elevation gain. Much of this trail makes for a fairly shaded hike or trail run, offering beautiful views from the wooden bridge over Lock 32, and the 1.5-mile hike in near Stanford House that ends at the plunging 65-foot Brandywine Falls. Great wildlife, beautiful photo opportunities, and a moderately strenuous workout make this a fine outing. Using the trail as a means to arrive in Peninsula—named one of This Old House Magazine’s “Best Old House Neighborhoods” in 2012—offers additional sightseeing fun. Hikers, bikers, and runners will all enjoy the views and the accessibility to Boston and Peninsula, as will anyone looking to spend a bit more time in the park. This stretch of the trail passes right by the historic Stanford House, which sleeps 30 and is available for rental, and the park’s five back-country campsites. Day visitors will enjoy the park amenities in Boston and the quaint shops and family-friendly restaurants in Peninsula.